Appliness is a new digital magazine and the first of it’s kind to focus entirely on web application development! Appliness was created entirely using Adobe Digital Publishing Suite, and the effort was lead by our own Michael Chaize. Go download a copy today! It’s also FREE! Be sure to also check out how this magazine was created using Adobes Digital Publishing Suite, and check out the video preview above. Interested in contributing in Appliness or providing us with valuable feedback? If so, you’re in luck–let us know here: http://appliness.com/give-us-feedback/. We’d love to hear from you! You can read more about this application on the PhoneGap Showcase. Facebook uses a forked version of Apache Cordova in their mobile SDK. You can learn more about Facebook’s mobile SDK at https://developers.facebook.com/docs/guides/mobile/, and check out some of the showcase apps that developers have built on top of the Facebook mobile experience at https://developers.facebook.com/showcase/mobile/. Salesforce uses a fork of Apache Cordova for their mobile development SDK. The forked version of their SDK is included within both their iOS and Android SDK repositories on GitHub (inside of the “external” sub directories). IBM recently acquired Worklight, who provides a platform for developing mobile applications. IBM/Worklight’s mobile application development platform is built on top of PhoneGap. IBM is also heavily involved with core Apache Cordova development (see the list of committers). (The license under “about” inside Halo Waypoint clearly has a reference to PhoneGap). Zynga, one of the largest gaming companies, uses PhoneGap and HTML5 to build awesome games. For example, the popular Mafia Wars title is built using PhoneGap. Logitech used PhoneGap to develop the Logitech Squeezebox Controller application, which uses your home wifi connection to control a Squeezebox Internet radio device from your smart phone. You can read more about this application on the PhoneGap application showcase, or download it now for iOS or Android. Still not sure if anyone uses PhoneGap? What about these, among many others? I’ve been “out and about” lately, attending tech conferences, meetup groups, and meeting with developers in their offices, and I am getting great feedback on mobile development and PhoneGap. There are some common questions that I am often asked, and I hope this post helps everyone understand PhoneGap better. Think of this as a “headless” web browser. It renders HTML content, without the “chrome” or window decoration of a regular web browser. You build your application to take advantage of this space, and you build navigational/interactive/content elements and application chrome into your HTML and CSS based user interface. The web view used by PhoneGap is the same web view used by the native operating system. 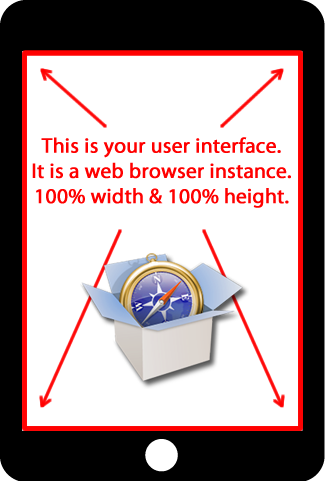 On iOS, this is the Objective-C UIWebView class; on Android, this is android.webkit.WebView. Since there are differences in the web view rendering engines between operating systems, make sure that you account for this in your UI implementation. You can read about the PhoneGap API and all of the native functionality it exposes at docs.phonegap.com. Specific application architectures are going to differ on a case-by-case basis, however most data-driven applications employ the following basic architecture. The PhoneGap application acts as a client for the user to interact with. The PhoneGap client communicates with an application server to receive data. The application server handles business logic and communicates with a back-end data repository. The application server is normally a web server (Apache, IIS, etc…) and has a server side scripting language such as ColdFusion, Java, .NET, PHP, etc… PhoneGap is agnostic of back-end technologies and can work with any application server using standard web protocols. The application server performs business logic and calculations, and generally retrieves or persists data from a separate data repository – this is normally a relational database, but could be any structure or mechanism for data persistence. PhoneGap applications generally do not talk directly to a database; communication is routed through an application server. The client to application server communication can be based upon standard HTTP requests for HTML content, REST-ful XML services, JSON services, or SOAP (or websockets if your OS supports it). These are the exact same techniques that you would use in a desktop-browser based AJAX application. Multi-page client-side application architectures are supported, but are not recommended because you lose in-memory variables when loading a separate page. Earlier this month, PhoneGap 1.5 was released. There were a lot of enhancements in this release. However, if you’ve tried to update an existing codebase from PhoneGap 1.4 to 1.5, you may have realized that things look a bit different. Basically, the entire PhoneGap codebase has migrated from PhoneGap naming to Apache Cordova naming conventions. Documentation that refers to the PhoneGap class may be out of date… just switch the name reference. This is just a naming convention change as the PhoneGap project is moving to its new identity as Apache Cordova. However, it is just a name. Be sure to read this article from the PhoneGap team to understand why the name changed and to understand the relationship between “PhoneGap” and “Cordova”. As a PhoneGap developer, how you build applications has not changed, and the power of PhoneGap/Cordova has not changed. You can still create awesome apps with it, and it is still 100% open source. If you are looking at code that doesn’t work in PhoneGap 1.5, then chances are you need to update to use the new naming conventions. If you are just getting started, be sure to check out my “Getting Started with PhoneGap” guides on Adobe Developer Connection for both Android and iOS – both of these articles use the new naming conventions. Ready for the new era in multi-screen development? Available now on labs.adobe.com, Adobe Shadow is a new, free tool that enables synchronized browsing and remote inspection across desktop and mobile experiences, in real time. Adobe® Shadow is a new inspection and preview tool that allows front-end web developers and designers to work faster and more efficiently by streamlining the preview process, making it easier to customize websites for mobile devices. Shadow will be updated regularly to stay ahead of web standards, web browser updates and support for new mobile devices entering the market, while incorporating user feedback to provide the best functionality and experience possible. Of course, don’t forget to go download Adobe Shadow and get started today (it’s free)!